Dr. MacKie is assistant keeper, Hunterian Museum, University of Glasgow, Scotland. This paper was presented at the McMaster University symposium, "Velikovsky and the Recent History of the Solar System, "June 16-19, 1974. "The dating of the megalithic observatories to the period from about 2000-1800 B.C. seems fairly secure and puts them firmly into the epoch preceding Velikovsky's major cataclysms of the 15th century B.C. In spite of this, the alignments so far identified do fit well with the present celestial system retrojected to the period concerned....... On the other hand..... the whole remarkable phenomenon of the relatively sudden appearance of standing stone sites—many of them clearly astronomical in function—as a well-defined episode in British pre-history could be neatly explained as the reaction to a natural disturbance in the celestial order. . . ."
In comparing Velikovsky's catastrophic hypotheses with the detailed historical and archaeological evidence from the numerous fields affected by them, it is necessary to select problems for study which are of crucial importance for the rival theories. One of these problems is that of the nature of post-glacial environmental changes-which I recently discussed briefly (1)—and another embraces the relics of prehistoric astronomical activity found in Britain, on which much detailed work has been done (2). Since this British material is held to be explicable only in terms of the present celestial order retrojected mathematically nearly 4000 years into the past—and since the field monuments concerned have been shown by independent evidence to be appropriately datable to the late 3rd and early 2nd millennia B.C.—it is clear that they do provide a crucial test for the view that the present world system was only established in 687 B.C. It is important that everyone—catastrophists, uniformitarians, and "don't knows" alike—understands the purpose of this article. It is to review the evidence as impartially as possible, and to try to decide whether this can be explained only on uniformitarian assumptions, or whether it can also fit a catastrophic theory but less well, or whether it in fact fits such a theory better. Since an alternative theory about the post-glacial history of the Earth and the Solar System now exists, and since it has had some success in anticipating discoveries in a variety of related fields, it seems only fair to regard the theory of uniformity at least as non-proven. One should question all deductions and assumptions based on it and test these against the actual hard evidence available, and one should, moreover, actively devise tests and experiments to determine which of the two scenarios best fits the facts. Thus, I am not engaged here in an attempt to prove or disprove any view, only to strip away all hidden assumptions and unquestioned beliefs and to lay bare the raw data for inspection. It must be recognized that in many fields insufficient data has been collected to make it possible to come to a clear decision as to which theory best fits the evidence, and that this may be one of those fields. Before the advent of radiocarbon dating, the British Late Neolithic and Early Bronze Age sites which figure prominently in this article were dated mainly by extrapolating backwards from a link detected with the historical chronologies of the Mediterranean in the 16th-14th centuries B.C. (3). This "Mycenaean horizon," it was thought, could be seen in a variety of imported artifacts in the later graves of the rich Early Bronze Age Wessex culture, of which the best known are probably the blue, segmented faience beads similar to those which were found in large numbers in Tel el Amarna, Akhnaton's capital. Stonehenge III, the sarsen structure, was brought into this horizon by virtue of the "Mycenaean dagger" found carved on one of its uprights. However, the correction of radiocarbon dates by the tree-ring chronology in the late 1960's seemed to make the Early Bronze Age cultures of Europe, including Wessex, too old to be contemporary with the Mycenaean civilization (4): by implication they should have been coeval with the Middle Kingdom of Egypt (and with the Middle Helladic period) rather than with the New Kingdom and Mycenae. Alternative explanations for the supposed archaeological links between Wessex and Mycenae have been suggested (5). This view of the early date of the Wessex Early Bronze Age has not been entirely accepted. However, it does seem to be clear that all the various building phases except the last at Stonehenge took place well before the Mycenaean period: the radiocarbon dates for Stonehenge itself and for Mycenaean sites support this view. The remarkable architecture of the third phase of building at the British site is thus unlikely to owe anything to Mediterranean tradition. Throughout this article I shall assume that the tree-ring calibration of C-14 dates is basically reliable and give the terrestrial year equivalents to each C-14 date. The latter are distinguished by having B.C. after them, while dates in "radiocarbon years" are written with b.c. The calibration tables used are those published in the recent MASCA Newsletter (6). During the last thirty years Professor Alexander Thom has developed in great detail a theory that the erectors of the numerous stone circles and standing stones of prehistoric Britain and Brittany were skilled practical field surveyors and had a considerable knowledge of geometry and observational astronomy (2). As noted, both the astronomical assumptions and the archaeological dating evidence place these standing stone sites very early in the second millennium B.C., so their importance for the catastrophic theory is clear, as the several discussions of Stonehenge in this context make plain (7). Thom has not yet published any analyses of Stonehenge (8), but has made out a much more formidable and detailed case for the astronomical use of scores of other simpler but related sites than Hawkins ever did for the famous site on Salisbury Plain. Yet his views have not, as far as I know, been analyzed in print with the catastrophic theory in mind (9). Two questions need to be answered: first, has Thom made out a convincing case that many standing stone sites were at useful astronomical observation points; and, second, if he has, can these only be explained in uniformitarian terms? Before trying to answer these questions, however, it will be useful to sketch in the basic principles of precise astronomical observations undertaken without optical instruments and without accurately built masonry constructions. It is convenient first to concentrate on the problem of tracking the yearly movement of the Sun, because the only way that the exact number of days in the year can be determined is by discovering the actual days of midsummer and midwinter. This knowledge can then be used to construct a precise calendar, the possession of which is surely essential for any more advanced astronomical work. Finding the time of the solstices under these conditions is, as we shall see, an extremely difficult task. At the present time the Earth's axis is tilted 23° 27' 8.3" away from a line perpendicular to the plane of its orbit (or 66° 32' 51.7" above that plane). This tilt has the result that the Sun's real position, seen against the unmoving starry background, not only changes laterally along the ecliptic as the Earth proceeds on its orbit (thus passing annually through the twelve constellations of the zodiac) but also fluctuates above and below the celestial equator. At the equinoxes it is on the celestial equator and has a declination (5) of 0' but at the summer solstice (for an observer in the northern hemisphere) it has risen to +23° 27' (north of the celestial equator) and at the winter solstice has dropped to -23° 27' (south of it). Since the celestial equator is a projection of the terrestrial equator, with a latitude of 0°, out onto the starry background (conveniently visualized as the inside surface of a hollow sphere) it follows that the declination of the Sun corresponds to the earthly latitude where it is at the zenith at midday and that the solstitial declinations mark the Tropics of Cancer and Capricorn-at latitudes 23° 27' north and south, respectively (fig. 1). Thus if there were some way in which the positions of the Sun at the solstices could have been marked in prehistoric times, the measurement of these marks today would show the tilt of the Earth's axis at the time the marks were set up. At the equator the Sun rises vertically in relation to the horizon so that the yearly change in its declination of 46° 54' (twice 23° 27') is represented by the same change in the bearing of its rising and setting positions on the horizon (fig. 2). However, as one moves north or south from the equator the angle between the Sun's diurnal path and the horizon decreases so that the band of declination changes 46° 54' wide is represented by a much larger swing along the horizon. At latitude 56° N in Argyllshire, Scotland, the swing is nearly 90°. The fluctuation of the Sun's rising and setting position is thus more obvious in latitudes far from the equator and, where such a latitude is combined with a hilly terrain, the chances are greater that a primitive people will have noted the seasonal changes of the Sun's position against natural marks on the horizon. It is thus easy to see how a non-literate people could keep an approximate track of the year by using natural marks in this way. However, Thom claims that the solar observatories in Britain were much more accurate than this and capable of defining the solstices and equinoxes to the day. Furthermore, he explains other standing stone sites as carefully designed observation points from which the much more complex motions of the Moon could be studied, and to such a degree that eclipse prediction may have been possible. These feats involve technical problems of observation which must be briefly described. At the solstices the real position of the Sun against the stars (its declination, measured to the center of the disc) changes extremely slowly as it stops moving north (or south) of the celestial equator and starts to move south (or north) again. The diagram (fig. 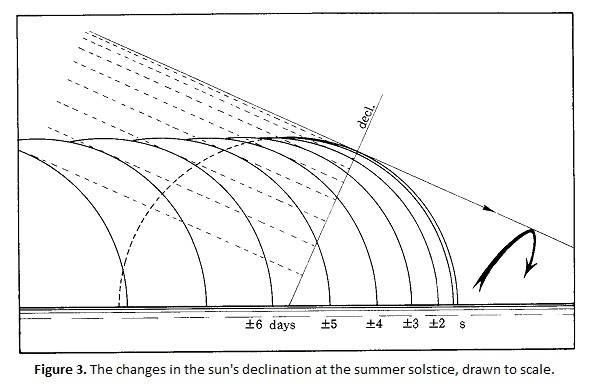 3) illustrates this; during the 24 hours before and after the solstice the present change in declination is only 12", or 1/160th of the diameter of the disc (32'), and this change increases with the square of the interval. How can this minute change be detected with the naked eye? Even the largest shadow-casting device is probably useless for this purpose because the width of the penumbra at the edge of the shadow increases with its length so that the edge is blurred. The only possible way available to a people with a Neolithic or Bronze Age technology is to use long sight-lines to the horizon. The method suggested by Thom involves the use of a distant mark on the horizon as a pivot against which a line of sight can be swung against the celestial sphere (the background of fixed stars) by moving one's position. In this arrangement the distant mark is the foresight and the observer's position the backsight. It is a common experience for an observer in a moving vehicle that a telegraph pole, say, 10 yards distant will appear to move more rapidly than a tree half a mile away. A short lateral movement of 10 ft. will seem to move the pole about 181/2° against the great circle of the horizon (360°) whereas the same short movement will provide a much finer adjustment of only about 1/4° for the tree. In the same way, if the foresight is a natural mark on the horizon—a notch or a mountain slope, say, 20 miles away—it will move only imperceptibly against the sky even if the observer moves many yards laterally. Such a miles-long sight-line is theoretically capable of defining positions on the sky-vault at the horizon to within a few seconds of arc. Indeed there is good evidence that the Classical Maya people of Central America—whose great skill and accuracy in astronomical observation is well known (10)—used this method. The codex Nuttall contains a drawing of a man looking out of a temple doorway through a pair of crossed sticks—a simple device to ensure that his eye is exactly in the right place—and presumably watching some celestial phenomenon from this high vantage point. Another drawing in the codex Bodleian shows an eye behind the crossed sticks, this time seen from the front, and nearby a star or planet rising or setting in a distant notch (11). This seems to be a clear demonstration that the Maya made use of long lines of sight to the horizon. The only alternative method open to a people without optical instruments is to construct giant sundials or gnomons. If a sufficiently large such shadow-casting edge was built it might be able to detect the points at which the Sun's midday shadow was shortest and longest and thus mark the solstices. At Delhi in India there is a masonry solar observatory dating to the 18th century which well illustrates this method, but the problem of the penumbra—which increases in width with the length of the shadow-must have made such observations tricky at the very least. Clear evidence has been collected by Thom that such long astronomical alignments were in use in Britain 4000 years ago. At scores of standing stones and stone circles he found that distant horizon markers were indicated in various ways-by a flat-sided stone, or two stones in a line or by a circle and an outlying stone. When the astronomical positions or declinations of these indicated horizon marks are plotted as a histogram, they are seen to cluster in marked peaks (12). This histogram is by itself very strong evidence of the practice of observational astronomy in prehistoric Britain, since the bearings or azimuths of the same horizon marks (their-position in relation to geographical north) would show a more scattered distribution. Moreover, many of the peaks of declinations occur at significant astronomical positions such as the solstices, equinoxes, the extreme positions of the Moon and so on. However it is important to be clear that the histogram is showing simply that the megalithic alignments do point consistently at certain positions in the sky: what celestial bodies were at these positions 4000 years ago has to be deduced from other evidence. There are two standing stone sites in Scotland, claimed as megalithic solar observatories by Thom (13), which are particularly important and a description of them will clarify the nature of these British sites in general and also illustrate the methods by which they could have been used. At Ballochroy on the west coast of the Kintyre peninsula, Argyll (Lat. 55° 42.5' N, Long. 5° 36.5' W), there are three standing stones set close together and in a row running northeast to southwest (fig. 4). Two of these have flat faces which are orientated towards the northwest and 18 miles across the sea in this direction is a striking row of four peaks—the Paps of (the island of) Jura. The right slopes of two of these mountains are each clearly indicated by one of the two flat-sided stones (fig. 5). Corra Beinn, at the right end of the row, is indicated by the tall central stone, where as the shorter right (northeast) stone is orientated towards the right slope of Beinn a Chaolais at the left end of the row of peaks. Such a site could have been set out as an observatory for determining the day of the summer solstitial sunset in the following manner. 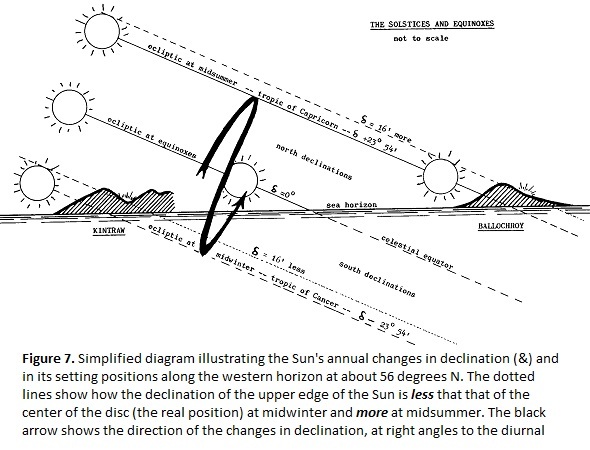 As midsummer approached, the observer would station himself each evening so that he made the Sun disappear behind the chosen peak and would then rapidly adjust his position sideways so that the upper edge of the disc just flashed into view again at the base of the right slope as it set (14). A single person can do this in the few seconds available but a row of stationary observers would be better, the last one of the line to see the flash marking the correct spot. This spot would be marked with a peg, and the same procedure would be repeated on each successive evening. Each time the Sun sets a little further to the north and the corresponding peg would be further to the southwest. As the solstice approached, the daily change in the Sun's real position becomes minute as described but, because of the distance of the Jura mountain foresight, even the final change of 12 seconds of arc would be represented at the Ballochroy stones by a lateral shift of about 6 feet between the two pegs concerned. This site is thus potentially a highly accurate solstice observatory which should, given the right atmospheric conditions, have been capable of defining the time of midsummer to the exact day. However, it is true that, under present climatic conditions, refraction and temperature changes-to say nothing of cloud and rain-would have ruined many of the observations. It is important to understand that the standing stones are not themselves observing instruments. They simply mark the backsight, the position at which the observer stands to see the phenomenon concerned. The instrument is the line from this backsight through some natural foresight to a point on the celestial sphere. The line thus defines the astronomical position, or declination, of the celestial body in question. At Ballochroy the line from the center stone to the right slope of Corra Beinn (fig. 5) marks a declination of +24° 10' and that from the right stone to the right slope of Beinn a Chaolais one of +20° 09'. The Sun now has an apparent diameter of 32' when seen from Earth, so if it set at these two marks with its upper edge just showing at them in the manner described, the center of its disc would have a declination of 16' (a semidiameter) less than those of the natural marks themselves, that is +23° 54' at Corra Beinn and +19° 53' at Beinn a Chaolais (fig. 5). There is no way of telling from this site alone which was intended to be the primary alignment. The left one is a more suitably shaped mountain as a foresight, its right slope having a smooth, concave curve which permits of no ambiguity in the observations made with it. Corra Beinn, on the other hand, has an irregular and slightly less accurate right slope and is the least suitable of the three peaks to act as a foresight. Yet this mountain is marked with the tall central stone while Beinn a Chaolais is indicated by the shorter right hand one. Either of the other two suitably shaped mountains—Beinn Shiantaidh and Beinn a Chaolais—could have been utilized as a summer solstice observatory when the Earth's axis was tilted at 23° 54' from the vertical simply by siting the stones further southwest down the coast. 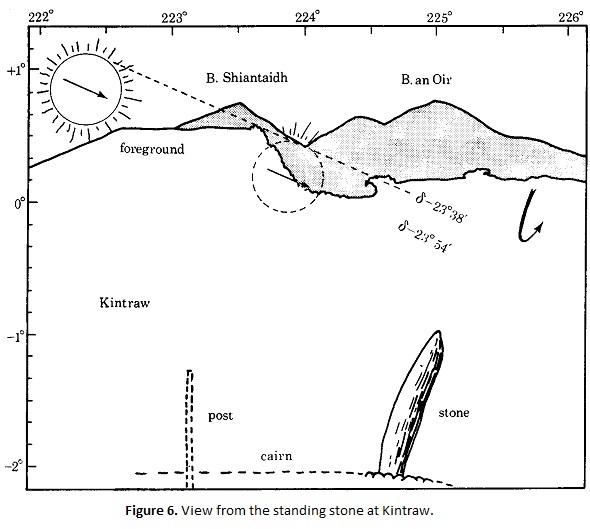 The declination of the sun at Corra Beinn, 23° 54', is found at many other standing stone sites, according to Thom, and these include the Kintraw stone, described below. There does not seem to be much doubt that the mountain does mark the position of the edge of the Sun at the solstice at some period in the past. This declination is of course outside—that is further away from the equinoctial point than—the present midsummer solstice of +23° 27', and the most powerful argument advanced in favor of a uniformitarian interpretation of these megalithic observatories is of course that the Corra Beinn solstice could have evolved uninterruptedly into the present one because the present solstitial position is moving very gradually in the same direction (the phenomenon is known as the precession of the equinoxes). Moreover this modern motion, when projected back into the past with the aid of the Newcomb formula, reveals that a solstice of 23° 54' existed at about 1800 B.C., a date which fits very well with the date of the standing stones derived from independent archaeological evidence (below). Clearly, powerful arguments would need to be marshalled against this apparently neat coincidence if a catastrophic interpretation were favored. Nevertheless, the anomalous alignment from Ballochroy to Beinn a Chaolais should not be forgotten. At +19° 53' the Sun is far inside the modern solstice position so that, if the line also marks a prehistoric midsummer position, that solstice could only have been altered into the direct ancestor of the present one catastrophically; the present solstice position is of course now moving towards it. As noted, the smoothly concave slope of Beinn a Chaolais is much more suitable as a solar foresight than that of Corra Beinn, but the stone pointing at it is the smallest of the three. The declination is not matched at any other recorded site and was not included in Thom's list (15). On the histogram of declinations it falls uneasily between two peaks at +16.89° and +21.84°, which have been interpreted as two points on the 16-month solar calendar inferred from the megaliths (16). This alignment is not understood at present. It can only be dismissed as of no consequence on uniformitarian assumptions, but if these are not valid it could provide an important hint that there may be other long solar sites which do not fit the uniformitarian theory. The second important solstice site claimed by Thom is near Kintraw farm, Argyllshire, some 40 miles north of the Ballochroy stones, A single stone 11 feet high stands in a flat field on an otherwise steep hillside and next to a large round cairn of Early Bronze Age type. This cairn was excavated in 1959-60 (17) but in this case the usual crouched inhumation burial in a central cist (box of stone slabs) was missing; instead, a socket for a post three inches in diameter—which had rested on the old ground surface—could still be traced near the center of the stone rubble forming the body of the cairn. From the stone a long view is had in only one direction, to the southwest down Loch Craignish. The same mountains of Jura are visible as at Ballochroy, this time about 28 miles away (fig. 6). The declination of the base of the deep notch between Beinn Shiantaidh and Beinn a Chaolais to its right is 23° 38' when viewed from the stone, so that the center of the Sun's disc with its edge just flashing through the notch would be at 23° 54'—exactly the same as when it set behind Corra Beinn as seen from the Ballochroy stones. Kintraw is plausibly interpreted by Thom as a midwinter solstice observatory and dated—through retrospective calculation of course—to about 1800 B.C. A more detailed description of this site is in the following section. The Kintraw site has fortunately presented archaeologists with an opportunity—so far unique—to test Thom's general astronomical theory by excavation, and the results of this test, which conclusively support Thom, are described in due course. Meanwhile there are several other good reasons for believing that this pair of sites by itself shows that the general theory is valid. (It is important to recollect at this point that what is being discussed here is the question of whether the standing stones were astronomical observatories, and not whether they fit a uniformitarian or a catastrophic cosmology.) One of the most impressive of the arguments derived from surface observation concerns both the quality of the two sites and the coincidence of the declinations of the foresights seen from them. Both Ballochroy and Kintraw are part of very long alignments—essential for precise work—and at both the mountains of Jura are the only possible distant foresights to be seen. At both the Sun could have set behind the peaks concerned so that the edge just flashed into view again momentarily as it slid down. At Ballochroy the mountains are actually indicated by the stones themselves and they may also be at Kintraw as we shall see. Perhaps the most impressive of the indications of the genuineness of these two observatories is provided by the declinations of the notches concerned (+24° 10' at Ballochroy and -23° 38' at Kintraw), even though these are quite clearly more than half a degree apart. However, if one assumes—as the Thom theory must—that the real measurement is to the center of the solar disc when its edge is at these measured marks, then the declinations do become identical at ±23° 54'. This is because the Sun has an apparent diameter of 32' when viewed from the Earth in its modern orbit, and when it is at the summer solstice the upper edge is a semidiameter (16') further away from 0° (the equinox) than the center of the disc. Hence one must subtract 16' from the declination of the natural mark (fig. 7). At the winter solstice on the other hand the edge at the mark is 16' nearer the equinoctial position, so that 16' is added to the declination of the marker to obtain that of the center of the disc. It is impossible to believe, first, that these two hillslopes should by chance be suitable as obsolete solstice observatories when seen from the standing stones, and, second, that they should indicate the same declination for the hidden center of the sun's disc in the way they do. Further important deductions, which are discussed below, can be made from this consistent 16' difference between the measured mark and the center of the disc at both summer and winter. However, a serious problem for the astronomical interpretation was apparent at the Kintraw site. From the standing stone it is just possible to see the crucial notch on Jura, but as soon as one moves to its left (southeast) the notch is hidden by a tree-covered ridge about a mile down the loch (fig. 6). Since the preliminary sightings on the evenings leading up to midwinter must have been taken along a track to the left of the stone (the reverse of the procedure for midsummer described earlier), it follows that the position of the site could not have been established from the level of the field, since the necessary observations are impossible. Clearly this is an awkward hurdle for the astronomical theory, particularly since Kintraw is otherwise an exceptionally convincing site for reasons already given. Nevertheless, the author of the theory was convinced that the mass of evidence from other sites, and the striking parallel with Ballochroy, outweighed this difficulty and he surmised that the necessary sighting observations could have been taken from the steep hillside northeast of the stone, beyond a stream in a precipitous gorge (18). There was indeed a large boulder there on exactly the right line and resting on a sloping terrace on this hillside, at the right elevation and just above the stream gorge. Clearly Kintraw presented a rare opportunity to test the Thom astronomical theory by excavation. This theory in effect predicted that observations must have been taken from a specific spot on an otherwise barren hillside, suggesting that there might well be an artificial construction of some kind there. If a standing stone or a platform was found at this spot, Thom's interpretation of Kintraw would be strikingly confirmed. Excavations took place at the site in 1970 and 1971 and revealed two large boulders instead of one, with their pointed ends together and forming a distinct notch (fig. 8). Into this notch ran a level rubble platform about 2 meters wide, which extended several meters upstream (southeast) along the slope; it did not appear to extend to the right of the boulder notch, that is, downstream. 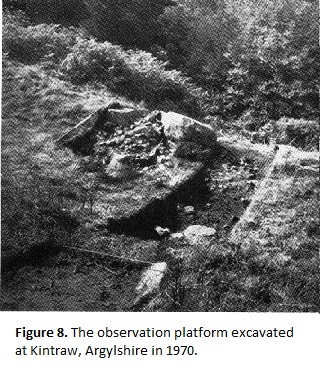 The absence of artifacts and other unambiguous signs of human activity made it impossible to decide for certain whether the boulders and platform were man-made or a product of nature: similar rubble platforms are known in Scotland which were formed by solifluction in periglacial conditions. The problem was eventually solved by a statistical study of the stones of the platform—termed petrofabric analysis—and by comparing the results with similar analyses of a known natural platform and of one from an Iron Age hillfort and known to be man-made. The results, recently described in detail (19), showed clearly that the Kintraw platform was an artificial construction. We need have no doubt therefore that in Britain in the Late Neolithic and Early Bronze Age periods which are now believed to have been largely contemporary-there were indeed skilled practical astronomers who marked the rising and setting positions of celestial bodies with great accuracy and in such a way that these positions can still be determined. The present apparent motions of the Moon are considerably more complex than those of the Sun, and this means that a prehistoric people, using the primitive observational techniques described earlier, would have needed to expend a much greater amount of time and energy in unravelling them than on the Sun. There is another major difficulty confronting any primitive astronomers interested in the Moon in its present orbital difficulty deriving from the fact that the satellite goes through the complete cycle of its changes in declination much faster than the Sun, in a month instead of a year. Hence the chances of the Moon being at its maximum or minimum declinations at the moment it rises or sets the only times when it can be tracked in the manner described earlier-are correspondingly much smaller. Again some of the other present lunar motions, described below, have long periodicities of up to 18.6 years, so that one must assume that decades or even centuries of patient observation (not to mention the massive effort involved in erecting standing stones) would have been required if all that Thom claims was in fact carried out in prehistoric Britain and Brittany (20). If the Moon's orbit were in the same plane as that of the Earth, its cycle of monthly changes in declination would be the same as those of the Sun over a year; it would run along the ecliptic 13 times faster than the Sun, eclipsing it at each new Moon and being eclipsed by it every full Moon. Each month it would rise to the same northerly declination as the Sun's at that time and then sink to the same southerly one. The greatest declination it could then reach would be that of the Sun at the solstices—conventionally represented by the Greek letter epsilon (ε)—and now equal to 23° 27'. However, the Moon's orbit is tilted in relation to the Earth's, the angle between them, represented by the Greek letter iota (ι), being 5° 9'. Thus the Moon's declination can be as much as 5° 9' greater than that of the Sun at the solstices and up to the same amount less than ε. These maxima and minima of the lunar declinations are referred to as ε ± ι. 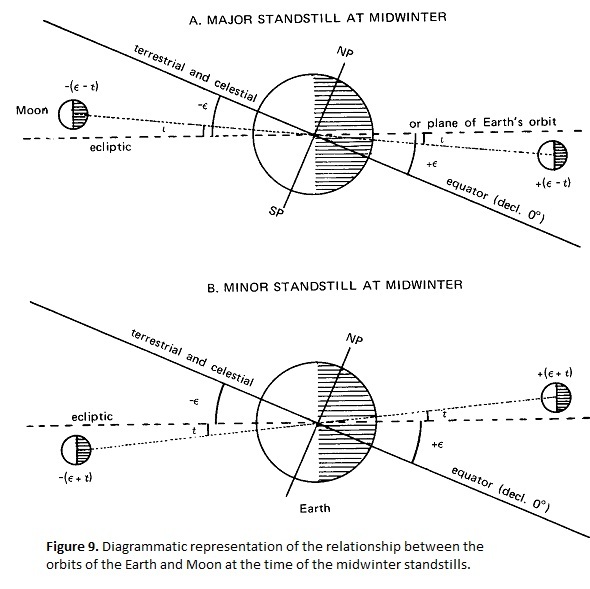 Such extreme positions will of course be reached only if the Moon is at the part of its orbit which is furthest above or below the plane of the Earth's orbit at the same time that the Sun has attained its greatest declination-at midsummer and midwinter (fig. 9). As seen from the Earth the Moon swings between its extreme northerly and southerly declinations and back again in a period of 27.21 days—the "lunar year" (technically the Draconic month and not to be confused with the synodic month—from one New Moon to the next-of 29.53 days). However, because of the tilt of the lunar orbit already referred to, these limiting declinations themselves alter from ε + ι to ε - ι over a period of 18.61 years (fig. 9): the monthly swing reaches a minimum range of twice 18° 18' (ε - ι) and, 9.3 years later, has achieved the maximum range of twice 28° 36' (ε + ι). Thom calls these minima and maxima in the extreme monthly declinations the minor and major standstills, respectively. When the Moon is at the latter point in its complex cycle at midwinter, for example, it is above the horizon for a large part of each 24 hours at every full moon for some months around midwinter and below it for most of the time at new Moon. Similarly at the minor standstills (fig. 9b) the full Moon is much lower and the new Moon much higher (the positions are of course reversed at midsummer). Superimposed on top of these movements is a "wobble" of ±9 minutes with a period of about half a year (173.3 days) and represented by the Greek letter delta (Δ). This tiny movement is thought to have been suspected by Arab astronomers in the 10th century (21) but was discovered and measured by Tycho Brahe in the latter part of the 16th century. It is caused by the extra "downward" pull of the Sun on the Moon when the latter is above the ecliptic and nearer the Sun than the Earth. The maximum effect occurs when the Moon is at the nodes—the points where the planes of the terrestrial and lunar orbits intersect and where eclipses occur—so that a knowledge of this wobble can be of great importance in the prediction of eclipses. The Moon's limiting declinations can therefore be up to 9' more or less than the amounts given above: for example, the position for the major standstill could either be ±(ε + ι + Δ), ±(ε + ι) or ±(ε + ι - Δ) and that for the minor standstill could be either ± (ε - ι + Δ ), ± (ε - ι) or ± (ε - ι - Δ). This totals 12 positions (fig. 9), but because either the rising or setting points could be used to mark each one, this total becomes 24. Then it is possible to mark the position of the Moon with an alignment by using either the edge of the upper limb, or that of the lower, or even the center of the lunar disc against a horizon mark, thus expanding the number of possible "significant" declinations of the Moon to 72. Of course the value of ε seen in the megalithic sites claimed as lunar observatories would have to be similar to that inferred from reliable solstitial sites like Kintraw and Ballochroy, that is about ±23° 54'. In fact Thom believes that Moon alignments were laid out between about 1800 and 1500 B.C. so that the value for ε (found through the retrospective calculations of Newcomb) can vary from about 23° 54' 28" to 23° 52' 29". If one lists the 72 "significant" lunar declinations for each of the four dates 1800, 1700, 1600, and 1500 B.C., one sees that there are thick clusters between about ±28° and 29 1/2° and again between about ±18° and 19 1/2° (because of the relative nearness of the Moon to the Earth the phenomenon of parallax has to be taken into account and the actual lunar declinations seen from the latitude of the British Isles are slightly different from those given here). It could be argued that any notch or mark in the appropriate position—that is within the four narrow bands on the horizon where the Moon rises and sets at its extreme northerly and southerly declinations—would be very likely to fit one of the four sets of 72 declinations quite closely. It might also be argued that there is a good chance of a notch being visible in a "significant" position from a point chosen at random in a hilly terrain—a contention which it would be easy and useful to check in a fieldwork experiment. However, if the horizon marks are actually indicated at the site—by a flatsided slab or by a pair of stones—then the chances are obviously much greater that they were intended as astronomical alignments, and if several such lines at the same site point to such "significant" declinations, then it clearly becomes more difficult to dismiss the arrangement as one resulting from chance. We may now examine briefly two standing stone sites which Thom has claimed as complex lunar observatories, noting in advance that none of these sites has yet presented an opportunity for a practical test of the theory such as was carried out at Kintraw. The standing stones at Nether Largie and Temple Wood are one mile south of Kilmartin in mid-Argyllshire and five miles south of the Kintraw solstice site described earlier (22). The site consists of a stone circle in Temple Wood and—327 yards to the southeast—an alignment of five standing stones running from northeast to southwest; the latter (Nether Largie) is 80 yards in length and consists of a pair of stones at each end and a single stone in the center (fig. 10). The members of the pairs are about 10 feet apart and point approximately northwest-southeast, back towards the stone circle. The site is on flat ground in the center of the narrow, northern end of the Kilmartin valley with hills visible not far away in nearly all directions. The two pairs of stones pointing to the northwest indicate a hilly horizon about 1 1/4 miles away on which there are several small, natural notches. From five positions along this alignment—of which three are marked by standing stones or, in one case, a group of small boulders—one of these notches marks five declinations suitable for the Moon setting at its greatest northern declination [+(ε + ι)], including the minute fluctuation in the extreme position caused by the 9-minute "wobble" (A). In addition the long axis of the alignment, pointing to the southwest, indicates the small but conspicuous Bellanoch hill and several of the notches and clefts next to this have declinations suitable for marking the Moon setting at its greatest southerly declination [the "major standstill" at -(ε - ι)] . This site is claimed to be particularly important because of the number of indicated sightlines there which now point to significant lunar positions retrojected 37 centuries into the past. The second claimed lunar site to be described briefly is at Ballinaby on the island of Islay, Argyllshire (23). Here there is an exceptionally tall and thin stone slab about 18 feet high which is orientated exactly towards two conspicuous crags 1 1/4 miles away in the northwest. The slope of the right crag has a notch with a declination corresponding to the Moon's setting position at the major standstill with the 9 minute wobble added, +(ε + ι + Δ). The base of the slope has a declination 9' less at + (ε + ι). The orientation of the stone towards the natural marks is exceptionally clear at this site. Few of the standing stones and stone circles of Britain and Brittany have been directly dated by radiocarbon, but enough have been fitted into the archaeological sequence to make one fairly confident that a large proportion of them belong to the end of the Neolithic period and the beginning of the Bronze Age. In terms of radiocarbon years this would be about 2000 - 1600 b.c., and in terms of calendar years (according to the Suess tree-ring calibration) about 2500 to 1800 B.C. (6). The best known site is probably Stonehenge, whose archaeological sequence has been carefully worked out and whose dating has been pinned down with several C-14 measurements (24). Stonehenge I was a Late Neolithic henge monument consisting of a bank and an external ditch, the 56 Aubrey Holes and probably the outlying Heel stone also. A date of 2180 ± 105 b.c. (I.2328: ca.2850-2870 B.C.) was obtained from charcoal from near the bottom of the ditch. Stonehenge II saw the start of the construction of the first stone circle on the site (a double one built with bluestones from Wales), the construction of the Avenue and probably the erection of the four Station Stones. Phase II is associated with Beaker sherds, a characteristic pottery which was brought to the British Isles at the beginning of the Bronze Age, apparently by a new round-headed people. The few radiocarbon dates for Beaker sites and graves elsewhere show that these people arrived at about 1800-1850 b.c. (perhaps 2190-2300 B.C.) and the date of 1620 ± 110 b.c. (I.2384: ca.2080 B.C.) for an antler pick associated with the construction of the double bluestone circle fits quite well with this (that it may be slightly late is suggested by the date of 1720 ± 150 b.c. [BM-46: ca.2150 B.C.] for another such pick associated with the construction of the massive sarsen monument of the following phase IIIA). Two radiocarbon dates were obtained from material under the surrounding bank, and elsewhere on the old ground surface, at the Cefn Coch stone circle at Penmaenmawr in Wales; these were 1520 ± 145 b.c. (NPL-11: ca.1940-1970 B.C.) and 1405 ± 155 b.c. (NPL-10: ca.1690-1720 B.C.). Another well excavated circular site, though without C-14 dates, is Cairnpapple Hill in West Lothian, Scotland (25). Here, too, there was a Neolithic structure, but the erection of the bank-and-ditch henge monument with its egg-shaped stone circle is associated with Beaker sherds and with a Beaker grave placed within the site a short time later. Further confirmation of the Early Bronze Age date of most standing stones and stone circles is found in the occurrence on a few of the stones of cup-and-ring carvings (fig. 10). Most such carvings are on natural, glaciated rock surfaces, but they have also been found on a few of the stone slabs used in Early Bronze Age cist graves (26). Thom has shown that these markings incorporate the same sophisticated geometry and metrology as that found in the stone circles (27). This view seems to be supported by a number of radiocarbon dates which are now available for the ceremonial sites known as henge monuments in southern England. These henges consist of a circular or near circular perimeter formed by a bank with an internal ditch (the reverse of the arrangement in the Iron Age hillforts) and usually with either one entrance or two opposed ones. The usual interpretation put on these sites is that the enclosed area was sacred or ceremonial in some way and that the bank and ditch served to define this area and emphasize its sanctity. It is characteristic of henge ditches that they were allowed to silt up and not re-dug; they thus served no practical purpose. The bank outside the ditch would have allowed an audience to watch what was going on inside the enclosed area. The origins of the henges probably lie far back in Neolithic times, in the irregularly shaped "causewayed camps" of the Early Neolithic Windmill Hill culture of south and southeast England (29). These "camps" used to be interpreted as cattle enclosures, but certain consistent features—notably the occurrence again of undisturbed rapid silting in the ditches—has caused informed opinion in recent years to swing in favor of the view that these, too, were ceremonial centers of some kind (30). The obvious conclusion is that they were the less standardized ancestors of the circular henges and the available C-14 dates from the two classes of sites do seem to show that there was a clear overlap in time between them (31). The causewayed camps probably date in terms of calendar years from about 4000 to about 3000 B.C., and a few were in use much later (32). In Middle Neolithic times, in the third millennium B.C. (calendar years), the circular henges were emerging: Stonehenge I may belong to this period as it has a date of about 2850 B.C. (2180 ± 105 b.c. : I-2328) and the henges at Arminghall and Barford probably do also. The former has a date of about 3000 B.C. (2490 ± 150 b.c. : BM-129), done on charcoal from the base of a post-hole, and the latter a date of about the same (2416 ± 64 b.c. : Birm-7) from a wooden platter belonging to the last phase of the site's use. However, the great Wiltshire complexes of wooden palaces or temples—which include Durrington Walls (and its close neighbor Woodhenge), Mount Pleasant and Marden—were certainly built in late Neolithic times. A series of C-14 dates for the construction and use of the giant henge at Durrington shows that it was built around the 26th century and continued in use at least until the 21st century B.C. (the most reliable construction dates include 1950 ± 90 b.c. (BM-395); 1900 ± 90 b.c. (BM-397); 1977 ± 90 b.c. (BM-398); 2050 ±90 b.c. (BM-400); 2015 ± 90 b.c. (BM-399); and 2000 ± 90 b.c. (BM-396). Dates of 1680 ± 110 b.c. (BM-286) and 1610 ± 120 b.c. (BM-285) were obtained for charcoal higher up in the silt of the ditch) (33). Woodhenge was built at about the same time or a little later (1867 ± 74, and 1805 ± 54 b.c. or 2190-2290 B.C. : BM-677 and BM-678). These two sites contained massive, circular timber buildings supported on several concentric rings of huge posts: the one at Woodhenge almost filled the enclosed area and two at least are known to have been inside the boundary ditch at Durrington (where only about 1/20th of the enclosed area has been explored). These buildings must surely be temples or palaces—or a combination of the two—and the excavator of Durrington drew attention to the similarities in design and apparent function with the great round wooden council houses of the Creek Indians at the Irene Mound site in Georgia. Thom's spectacular discoveries about the astronomical and geometrical expertise available in highland Britain at this time must imply the existence of a trained class of priest astronomers, and the place for these to be trained could well have been Salisbury Plain, where the greatest ceremonial sites known—Stonehenge and Avebury—are located. Only three kilometers northeast of Stonehenge lie Durrington Walls and Woodhenge—with huge, wooden buildings inside ritually demarcated, ditched enclosures—and here perhaps were the training schools, residences and temples of the specialist class who did all this work (34). The parallel with the Classic Maya culture of Central America seems particularly apt (10). There seems to have been an upsurge of activity among this class in the Stonehenge area towards the end of the third millennium B.C. (calendar years) when the huge wooden sites were built and when the stone monuments were put into Stonehenge. In fact it has long been realized that there is good archaeological evidence that the Late Neolithic culture which is closely associated with the Wiltshire ceremonial sites is widespread over the country, and this could now be reasonably interpreted as the effect of the outward spread of the specialized groups who used the centers, a spread already clearly demonstrated by the occurrence of an identical geometry and measuring system in the stone circles throughout the country (34). This expansion, or whatever it was, occurred in Late Neolithic times and is seen in the appearance of the characteristic Grooved ware of the Wiltshire henges (it was found in quantity at Durrington) in places as far away as the Orkney islands. Of course, there are alternative explanations of the significance of this wide spread of Grooved pottery-the currently fashionable doctrine of independent invention having inevitably been applied to it-but a close link seems indicated both from a detailed study of the pottery (33) and from other data described below. The famous stone villages of Skara Brae and Rinyo on Orkney belong to the Late Neolithic/Early Bronze period also, and Skara Brae—the better preserved of the two—yielded much Grooved ware when the remaining undisturbed stone houses were subjected to their first proper archaeological examination in 1928 and 1929 (36). Far from being simple herdsmen's villages translated into stone—the standard diagnosis (37)—it seems more likely to me that these two unique settlements were the specially built Late Neolithic residences for a group of astronomer-priests and wise men having close links with the Wiltshire centers, and some of whom may actually have come from the south. Only five miles southeast of Skara Brae is the huge stone circle and henge monument called the Ring of Brodgar (38), which Thom has recently diagnosed as a complex astronomical observatory (39), and which is very probably contemporary with the village. None of these discoveries, new and old, have been linked together in this manner before, but when they are (34), they seem to give a surprisingly clear picture of a burst of activity by the presumably long established astronomer-priest class soon after 2500 B.C., a picture which is formidably reinforced by the clustering between 2100 and 1700 b.c. of the many new C-14 dates for the relevant sites (40). The outline of another problem may be seen when the data is viewed in this way. After a relatively short occupation, probably of only a few generations, Skara Brae was overwhelmed by a natural catastrophe which evidently included a violent sandstorm (36). At the Ring of Brodgar many of the tall, thin, standing stones have been snapped off near the ground, some probably in ancient times; the stumps remain in position, while the slabs lie prone close by, buried under the peat. It is not known what force could snap a slab of Orkney sandstone nine inches thick in this way, but it must have been considerable. This phenomenon of snapped-off stones is apparent at a number of other sites and is perhaps more indicative of natural violence than the equally widespread phenomenon of standing stones which have fallen over in one piece or have been completely shattered, and which could be due to a number of causes (as at Stonehenge and Avebury) (41). The largest known once standing stone is Er Grah (le Grand Menhir brisé) at Lochmariaquer in Brittany and this colossal mass must have weighed something like 360 tons when entire. The manner of its erection by prehistoric Bretons defies the imagination, but a vivid picture of its fall is obtained from its present condition (fig. 11). The stone looks as if it has been struck about a third of the way up by a lateral blow from an enormous sledgehammer; the base has tipped over to the right but the upper part has collapsed to the left and broken into three fragments in doing so. Of course these scattered facts may mean nothing when considered together or they may mean a great deal. There is not yet enough hard data available and there will not be until the fall of the snapped stones at the British sites is dated by radiocarbon (by lifting the slabs in controlled Archaeological excavations and looking for charcoal or peat underneath). This problem provides another good illustration of the maxim that, where the conflict between catastrophism and uniformitarianism is concerned, "absence of evidence is not evidence of absence." The evidence for or against one or more universal destructions of the standing stone sites may be waiting to be collected at the sites themselves, but it is not available yet because the appropriate questions have not even been asked until now, let alone followed up with fieldwork. It is a maxim that interested scientists and scholars, on both sides, should constantly bear in mind—particularly those who believe that mathematics can unlock the secrets of the past without the confirmation of practical experiments. There can be little doubt now that a substantial proportion of the British and Breton standing stone sites were set up with astronomical purposes in mind. The solar solstice observatories in particular are most convincing and the excavations at Kintraw have given a clear demonstration of their genuineness. The sites claimed as lunar-though not so convincing when considered on their own-are much more so now that the astronomical interpretation in general has been vindicated at Kintraw, unless there are good reasons for supposing that the Moon was on a different orbit about 4000 years ago. Even a slightly different orbit could invalidate most of the specific conclusions about the lunar sites because of the several, precisely documented small changes in the Moon's declination which are claimed to be exactly reflected in the many horizon foresights. No plausible explanation of the relatively sudden appearance of these megalithic observatories during the period 2300-1800 B.C. has been offered and it cannot be denied that the occurrence of a global cataclysm towards the end of the 3rd millennium B.C.—with a consequent need to re-define the apparent movements of the Sun and Moon—would provide an ideal explanation for the whole phenomenon, particularly for that of the enormous quantity of physical and mental energy which must have been expended on the hundreds of standing stone sites over the whole area concerned. If a period of instability of the Earth's crust followed the cataclysm, causing frequent earth tremors, the snapping off of many standing stones near the ground would be well explained, as also would the peculiar architectural features of Stonehenge IIIA (mortice and tenon joints in the stones and immensely deep foundations for the uprights). There is in fact a certain amount of evidence for a widespread change in the relative levels of land and sea all over northern Europe at about 2000 B.C. and also for a period of migration and important cultural change (the Beaker period) in Britain and on the continent at about the same time. Thus the final and most widespread phase of megalithic astronomy could easily take its place in the archaeological record as the response of a class of wise men to drastic environmental and cultural changes at the end of the 3rd millennium B.C. Such an explanation would fit both the uniformitarian interpretation of the standing stones and a general catastrophic hypothesis unless later disruptions of the celestial order occurred. It is claimed that they did so—in the 15th and 8th centuries B.C. (42)—so several questions need to be answered. The first is the one posed in the second section—are the megalithic astronomical alignments only to be explained in uniformitarian terms? Second, is their dating to the end of the third and the start of the second millennium B.C. reliable? Third, do they themselves shed any light on the question of whether sudden cosmic changes have in fact occurred? A further important deduction can be made from these two sites. As explained above, the declinations marked by the hillslopes have to be-and are-one solar radius more than the solstitial declination at the midsummer site and the same amount less than it at the midwinter one. Hence the difference between the declinations of the hillslopes at these two complimentary sites should exactly define the apparent diameter of the solar disc when the alignments were laid out. This diameter proves to be 32' and indistinguishable with the naked eye (or with a theodolite) from the modern figure, so we can be reasonably sure that the Sun was at about the same distance from Earth as it is now when the stones were set up. It is easy to calculate that if the Earth once revolved on an orbit "somewhat closer than the present orbit of Venus" (42), say 65 million miles, the solar disc would then have had an apparent diameter of 46 minutes and that the size of this larger Sun would easily be detectable in any solstice sites laid out at the time. We may therefore conclude that, whatever the conditions were in the 3rd millennium B.C., by the end of that millennium the Earth and Sun were in approximately their present relative positions (a change of a few days in the length of the year, assuming that this reflected a slight change in the size of the orbit, would not be detectable in this way). As far as I am aware this is the only precise direct evidence for the apparent size of the Sun's disc in antiquity—and moreover for an era (the Middle Kingdom of Egypt) claimed by Velikovsky to have begun and ended—with global cataclysms (42)—so it is clearly of considerable interest. Obviously much depends on the date of the two solstice sites concerned, reviewed again later. Further interesting deductions can be made about the celestial order of about 2000 B.C. 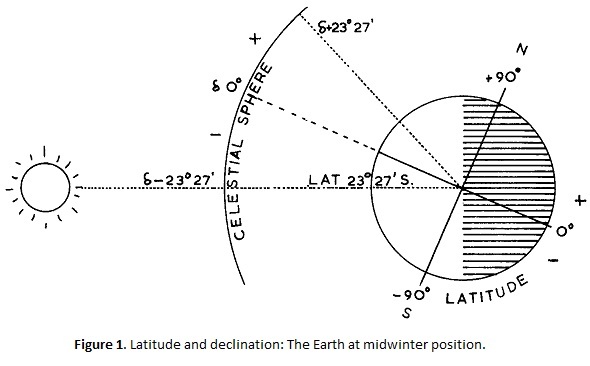 from the Kintraw site on the assumption that it really was a winter solstice observation point set up at a time when the Earth's axis was tilted at 23° 54' from a line perpendicular to the plane of its orbit. When testing the hypothesis that the Earth has been involved in cosmic catastrophes, one must allow that explanations other than that the site was designed as a winter observation point for the setting sun may have to be considered. The suggestion has been made for example that not only was the Earth once rotating from east to west instead of from west to east as at present (42) but that the very celestial directions of the poles themselves may have been reversed (42). Fig. 12 illustrates in diagrammatic form the Kintraw observation point—with its rubble floor for preliminary sightings extending to the left or southeast—in relation to the present celestial order and to three hypothetical ones, all shown at what is now the midwinter position for the northern hemisphere. 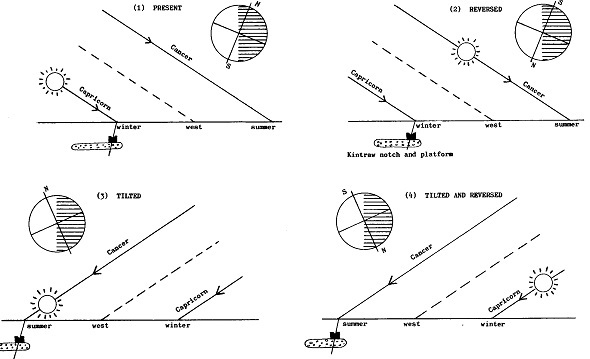 The two systems on the right show the poles reversed, the two on the left show them "upright": the top two diagrams show the axis tilted towards the present North Star, the two lower ones arbitrarily imagine that the axis has been tilted some 68' towards the south at midwinter. It is clear of course that a megalithic alignment could not in any case distinguish between an east-west and a west-east rotation of the Earth, but can the arrangements at Kintraw and Ballochroy rule out any of the others shown (we can assume that they have already ruled out any system based on a different geographical pole)? It is immediately clear that whatever celestial system is postulated, the observation path must run to the left of the boulder notch observation point at Kintraw and not to the right. Only a site like Ballochroy, which was aligned towards the right (geographically north) edge of the Sun's band of declination changes, could have a sighting path running to its right. A complete reversal of the celestial poles would turn winter into summer, or vice versa, at the time it occurred, but it would not affect the type of observatory needed at Kintraw, even if it was actually a midsummer one (nos. 3 and 4 in fig. 12). If the celestial pole were tilted (or tilted and reversed) in the way shown, the daily path of the sun would reach its zenith in the north instead of the south (as it does in the southern hemisphere now) and the angle between its path and the horizon would be drastically changed. The Kintraw site could reflect such a state of affairs since, in that case, the Sun could have glided up or down the left slope of Beinn a Chaolais instead of along the right slope of Beinn Shiantaidh, and presumably the same notch could have been used. This could also be postulated at Ballochroy and in fact the left slope of one of the indicated mountain foresights—Corra Beinn—is more smoothly convex and suitable as a solar marker than the right slope! However the main point is that there is absolutely no evidence from these megalithic sites to show that the celestial order was drastically different from the present one when they were set up and, equally, there can be no evidence from them that the axis was not completely reversed. Presumably it would be possible to calculate what the celestial sphere would look like behind these two foresights if the axis were turned towards the south—and to see if the sun's path with its zenith in the north fitted the left slopes of the mountains as well as it does the right slopes under the retrojected present celestial order-but it is a project beyond my present resources and is perhaps an unnecessary one in the present state of our knowledge. We may conclude that the observatories at Kintraw and Ballochroy were set up as complimentary midwinter and midsummer solstice observatories at some period in the past when the Earth's axis was tilted (upright or reversed) at an angle of 23° 54' and when the apparent size of the solar disc was almost exactly the same as at present. Winter and summer sunsets occurred in the same relative positions as at present, though they could have been reversed if the north celestial pole was then tilted upwards through about 68' towards the south. There is no evidence from the sites relevant to this possibility, or to the direction of the Earth's rotation. The geographical pole was in its modem position and so, therefore, were the cardinal points and the equinoctial sunrises and sunsets. In view of the several positive conclusions drawn from the British megalithic observatories, their date becomes of crucial importance in the context of their implications for the catastrophic theories of Velikovsky. It has to be admitted first that hardly any standing stones-and certainly neither Kintraw nor Ballochroy-have been independently dated by radiocarbon, so that we have to rely on analogies with dated stone circles and on the fragments of archaeological evidence. However, there is a variety of dating evidence from other sites which combines well to show that the standing stone sites as a whole probably belong to the overlapping Late Neolithic and Early Bronze Age periods as described. This conclusion is derived from several strands of evidence-archaeologically datable finds associated with standing stones, cup-and-ring carvings on such stones and also on Early Bronze Age graves, and radiocarbon dates for a few stone circles and henge monuments-and it is in little doubt. If the dates for this period of about 2000-1700 B.C. are corrected by the bristlecone pine tree-ring calibration (6), they become about 2500-1800 B.C., with some late sites like Stonehenge IIIb and IIIc probably being redesigned for a few centuries after that. Even if the tree-ring calibration is not taken into account, the mass of C-14 dates now available for the great period of ceremonial/astronomical activity in Late Neolithic times still cluster between 2000 and 1700 b.c. We are thus left with the inescapable conclusion that—if these sites do represent the reaction of prehistoric British astronomer-priests to a disturbance in the celestial order—this disturbance must have occurred towards the end of the 3rd millennium B.C., perhaps at the time of the end of the Old Kingdom of Egypt. We are further forced to conclude from the evidence reviewed here that during the early part at least of the Middle Kingdom the Earth's orbit was similar in size to its present one and that our planet's axis—though it could have been reversed—was most probably aligned in a similar direction to the present one in relation to the celestial sphere. The geographical pole was also in its present position. The question of the detailed interpretation of the megalithic astronomical alignments must now be considered and in particular the problem of whether it may be fairly concluded that they could only have been designed to observe the modern celestial sphere retrojected mathematically to 1800 B.C. The sites claimed as solar and lunar must be analyzed separately with this in mind. The solstice sites by their very nature can only indicate the angle of tilt of the Earth's axis at the time they were set up. If the theory of uniformity is to be regarded as non-proven, they cannot by themselves be dated in this way to ca.1800 B.C., nor can they be said by themselves to prove that the celestial order has evolved uninterruptedly from the time they were erected to the present. However, it must be admitted that the general data for the standing stones deduced from the archaeological and C-14 evidence-early in the 2nd millennium b.c. fits very well the date, computed mathematically on uniformitarian assumptions, for a solstice at 6 ±23° 54'. The fact that the prehistoric solstice marked by the megaliths was outside the modern one-so that it could have evolved into it without being disrupted (the positions of the solstices are still gradually moving towards the equinoctial points)-is undeniable and a strong point in favor of the uniformitarian interpretation. Yet clearly there is nothing in the megalithic alignments themselves to show that the solstice did not subsequently shift inwards to a position within that of its modem position and then out again to a point from which it could evolve slowly to its present location. Such a hypothesis might be regarded as far-fetched unless some supporting evidence were found. Such evidence would ideally be in the form of long, clearly defined megalithic alignments which consistently indicated a "future" solstice inside the present one, at a declination, say, of about 22° or less, since no amount of special explanations could make sense of these as ancestors of the modern celestial order. It is not surprising perhaps that such "future" solstice indicators are almost unknown, since the possibility of their existence has not been raised until now and consequently they have not been looked for except by myself on the few occasions that the opportunity has presented itself. 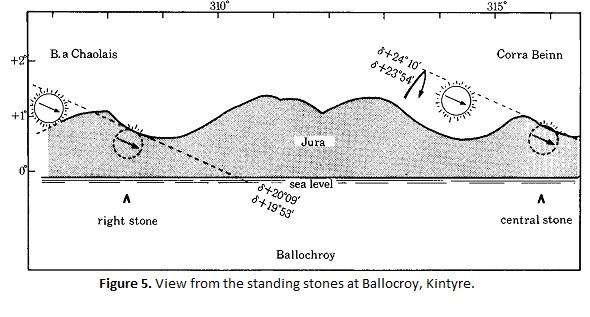 The second alignment at Ballochroy might be interpreted in such a way; with a declination of about 19° 53' it points well inside the present solstice and is inexplicable in uniformitarian terms, even as an intermediate solar calendar marker (Part I above). There may be others like it waiting to be found, and indeed I have seen signs of such possibilities in various parts of Scotland, but have not yet had the opportunity to do the systematic fieldwork which will be required to check them. The claimed Moon observatories are, on the surface, very difficult to explain other than in uniformitarian terms. This is both because of the complexity of the Moon's motions as seen from the Earth and also because of the apparent close fit between many of the megalithic alignments and these irregularities. The catastrophic theory clearly implies that the Moon's orbit changed several times in the 8th century B.C. alone (42), so that theory could hardly allow the satellite to have revolved on its modern orbit-and at the same angle as at present to the Earth's orbit-in 2000 B.C. when the megalithic alignments were being set up. The uniformitarian interpretation on the other hand can assume the same angle between the orbits as now (5°9') and the same 9-minute, half-yearly perturbation; it has only to allow for the slightly greater value of c at ±23° 54' to which these other values must be added and subtracted to obtain the Moon's extreme declinations. On the other hand, if we are regarding the theory of uniformity as non-proven, it is undeniable that the claimed lunar alignments are much more likely to be found where they are expected according to a preconceived theory. There are two main reasons with which to justify this rather challenging statement. The first is that, as explained earlier, there are so many "significant" positions—72 in fact—which could be marked by an alignment that a notch or mountain slope could well be at one of these by chance at many sites. The second reason is that, because of the relative rapidity of the daily changes in the Moon's declination, and because it is not an exceptionally bright object, foresight markers of almost any kind and only short distances from the backsight could be used, even quite inconspicuous notches and bumps. Thus the very clear-cut, distant markers which are ideal for solstice sites are not needed for lunar observatories and this means that almost any irregularity on the horizon could qualify as a lunar marker. The probability of some such being found by chance in the "correct" position is thus correspondingly greater (and this would also apply, presumably, to any supposedly different lunar orbit of the past). Against this there are several sites identified by Thom as lunar observatories—like Temple Wood in Argyllshire (22) and the Ring of Brodgar in Orkney (39)—at which a number of alignments may exist. 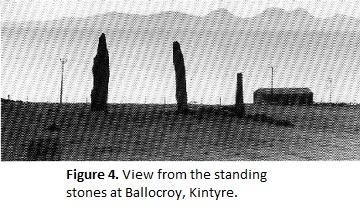 It is clearly more difficult to dismiss a site with multiple lunar sight-lines (running from the same backsight to different foresights) as the result of chance than it is a solitary alignment from a single standing stone like Ballinaby in Islay (23) or Beacharr in Kintyre (43). Nor must it be forgotten that the fan-shaped stone rows of Caithness in the extreme north of Scotland have been plausibly interpreted by Thom as devices for working out the maximum lunar declinations from the observations made with the alignments (44). Because of the relative rapidity of its real daily movement, the satellite, as explained earlier, is unlikely to be exactly at one of its maximum or minimum declinations at the moment of rising or setting, the only times when its position could be accurately observed and recorded by prehistoric man. By using the stone rows as a form of graph paper the maximum declinations could have been plotted mechanically from the observations taken immediately before and after the lunar standstills. Presumably these grids of standing stones—if they were indeed used in this way (and Thom's is the first systematic explanation for them ever advanced)would not have worked for a Moon whose motions were radically different from its present ones, though this assumption is obviously open to testing. In the present state of research into the prehistoric astronomical activities in Britain and Brittany several reasonably firm conclusions can be drawn. In the first place the dating of the megalithic observatories to the period from about 2000-1800 B.C. seems fairly secure and this puts them firmly into the epoch preceding Velikovsky's major cataclysms of the 15th century B.C. In spite of this, the alignments so far identified do fit well with the present celestial system retrojected to the period concerned, and there is also fairly clear evidence that the Sun had the same apparent diameter as at present and that the geographical position of the poles 4000 years ago was the same as now. On the other hand, the alignments do not, in my view, disprove the catastrophic theory and there is a distinct possibility—not so far adequately investigated—that there are others which may fit such a theory better. The whole remarkable phenomenon of the relatively sudden appearance of hundreds of standing stone sites—many of them clearly astronomical in function—as a well-defined episode in British pre-history could be neatly explained as the reaction to a natural disturbance in the celestial order and, as we have seen, important cultural and possibly environmental changes are known to have occurred at about the same time—approximately when the Egyptian Old Kingdom was coming to an end or soon after. In general further research into the megalithic alignments is needed with the specific object of searching for evidence bearing on the catastrophic theory. One final question may be asked after reviewing the archaeo-astronomical evidence. If we can assume, for the sake of argument, that Velikovsky's general catastrophic theory is broadly correct but that modification of it in detail is allowable, it may be possible to reconcile some of the apparent conflicts outlined earlier. Could it be that the pair of great catastrophes deduced to have happened in the 15th century B.C. in fact happened earlier, at the end of the Old Kingdom in Egypt? That vast array of detailed hard evidence reviewed here would then fall neatly into place and it would remain only to explain the less violent disturbances of the celestial order inferred to have happened in the 8th century B.C. in terms of British megalithic astronomy. I have added a short section on Stonehenge to the text of the paper distributed at McMaster University in June, 1974, because this site is the best known of all those connected with British prehistoric astronomical practices and because—in contrast to the rest of the standing-stone sites—its nature and dating have featured more than once in discussions of Velikovsky's catastrophic theories (7). I offer here a summary of a reinterpretation of the dating and development of the site, the full justification for which will appear elsewhere (34). The main new evidence is provided by the correction of the five C-14 dates for Stonehenge by the tree-ring chronology. Not only does this lengthen the history of the site backwards by half a millennium or more, but it forces us to reconsider some aspects of the site sequence worked out as a result of the excavations of the 1950's (24). The result is a new view of the history of the site (fig. 13), involving at least two "periods of crisis," which should have some interest both for orthodox archaeologists and for students of catastrophism. Since the excavations of the 1950's, the basic sequence of structures and features on the site has been well understood (24). Stonehenge I consisted of the bank and ditch, the Aubrey holes, and probably the outlying Heel stone. It is a Late Neolithic henge (ceremonial site) and a date of not much before 1800 B.C. seemed to be supported by the first radiocarbon date obtained, for charcoal from one of the Aubrey holes. More recently, a date of 2180 b.c. for the digging of the ditch has implied a slightly earlier date for the construction of the site. The Beaker pottery and the C-14 date associated with the Avenue and the earliest stone circle, Stonehenge II (the Q and R holes), seemed to confirm a date of about 1800-1700 B.C. for this new phase of activity, at the beginning of the Bronze Age, and the elaborate sarsen structure of Stonehenge IIIA evidently quickly replaced the uncompleted phase II circle. The later changes in the bluestone setting—from the uncompleted double circle of the Y and Z holes (phase IIIB) to the present circle and horseshoe (IIIc), were thought to have followed fairly quickly on the completion of the sarsen monument, although when the C-14 date of 1240 b.c. for a Y hole became available, it suggested that two or three centuries might have elapsed before the final rearrangement of the site. Atkinson surmised that the repeated changes of plan at Stonehenge were caused by a human or natural disaster. The correction backwards of the five C-14 dates by the tree-ring calibration has two implications for the history of Stonehenge. In the first place it requires that the construction of Stonehenge I took place at about 2800 B.C., during the early part of the Old Kingdom of Egypt and probably before the great age of pyramid building (the same would be true of the great earthen mound of Silbury Hill). The second implication is that a clear gap of about five centuries has to be inserted between Stonehenge IIIa —the sarsen circle and horseshoe of trilithons—and the final rearrangements of the site described as phases IIIb and IIIc (4). The sarsen monument in all probability was put up at the end of the third millennium B.C., whereas the final two settings of the bluestones were constructed in the 16th or 15th centuries B.C. (fig. 13). The archaeological evidence certainly does not conflict with this extended chronology—which divides the stone circle-building activities at Stonehenge into two distinct periods—and in my view is explained better—by it. We can now see not one but two "periods of crisis"—involving disasters of some kind—during which the stone structures at Stonehenge were repeatedly rearranged. The first period of crisis should have occurred perhaps between 2200 and 2000 B.C. and at this time the ring of Aubrey holes may have been dug, the Avenue was constructed, the Station stones probably erected, the monoliths of blue dolerite were brought from south Wales to be built into a double circle (Q and R holes), and the sockets for this double circle were nearly all dug. A change of plan prevented the digging of the last few sockets, and the splendid and unique sarsen monument was erected instead. The immensely deep foundations for the sarsen monoliths, and the elaborate system of interlocking mortice-and-tenon and groove joints for the uprights and their lintels, may stimulate some fresh reflections about the kind of crisis which was experienced on Salisbury plain at that time. Might these features have been designed to resist the effects on the structure of earth tremors? A long period of stability can now be assumed to have followed during which some of the bluestones were built into a setting of dressed monoliths which included at least one trilithon and a strange pair which apparently stood or lay edge to edge in contact and linked by a long tongue and groove joint. The rest of the bluestones were apparently used or stored off the site. Then in the 16th or 15th centuries B.C. a second period of crisis began during which the dressed bluestone setting was dismantled, the joints on its stones battered off where possible, and most of the sockets for a new double circle of bluestones (the Y and Z holes) were dug. This project too was abandoned before completion—the sockets being left empty to fill slowly with silt—and all the 82 bluestones were built into the simple circle and horseshoe setting, the remains of which we see today. The site was doubtless used as a ceremonial center for centuries afterwards, but no more constructional activity seems to have taken place. It is true that this new scheme depends on relatively few C-14 dates (only one in fact for the supposed second period of crisis) and on the assumption that the tree-ring calibration of C-14 dates is broadly correct. It is also true that it fits the archaeological data well with no obvious conflicts-better in my view than does the original site sequence devised—and that it emerged spontaneously from a consideration of that data and the C-14 dates alone during the writing of a chapter for a book (34). As far as I am aware it did not result from a desire to fit Stonehenge into any particular pattern. The problem of the nature of the astronomical sight-lines at Stonehenge, and of which belong to which period in the site's history, is a complex one requiring separate and detailed treatment (8). (1) E. W. MacKie, "A Quantitative Test for Catastrophic Theories," Pensée 3 (1973): 6-9. (2) A. Thom, Megalithic Sites in Britain (1967); Megalithic Lunar Observatories (1971). (3) V. G. Childe, The Dawn of European Civilisation (1956), pp. 334 ff. (4) C. Renfrew, "Carbon 14 and the Prehistory of Europe," Scientific American 225 (1971): 63-72. (5) C. Renfrew, "The Tree-ring Calibration of Radiocarbon: An Archaeological Evaluation," Proceedings of the Prehistory Society 36 (1970): 280-311. (6) E. K. Ralph, H. N. Michael & M. C. Han, "Radiocarbon Dates and Reality," MASCA Newsletter, vol. 9, no. I (August, 1973): 1-18. (7) I. Velikovsky, "On Decoding Hawkins' Stonehenge Decoded," Pensée 2 (1972): 24 ff. (8) Since this was written he has. A. Thom, A. S. Thom and A. S. Thom, "Stonehenge," Journal of the History of Astronomy 5 (I 974): 71-90. (9) This paper is a revised and elaborated version of the second half of a lecture I gave at Lewis and Clark College, Portland, Oregon, in August, 1972. (10) S. G. Morley and G. W. Brainerd, The Ancient Maya (1956), chap. XII. J. E. S. Thompson, The Rise and Fall of Maya Civilisation (1956), chap. IV. (11) Morley and Brainerd, The Ancient Maya, p. 258. (12) Thom, Megalithic Sites in Britain, p. 102. (13) Ibid, pp. 151-56; Thom, Megalithic Lunar Observatories, pp. 36-40. (14) Thom, Megalithic Lunar Observatories, pp. 13-14. (15) Thom, Megalithic Sites in Britain, pp. 97-101. (17) D. D. A. Simpson, "Excavations at Kintraw, Argyllshire," Proc. Soc. Ant. Scot. 94 (1966-67): 54-59. (18) Thom, Megalithic Lunar Observatories, p. 39. (19) E. W. MacKie, "Archaeological Tests on Supposed Prehistoric Astronomical Sites in Scotland," Philosophical Transactions of the Royal Society of London, Sec. A, vol. 276 (1974), 169-94. (20) Thom has described his work in Brittany in Journal of the History of Astronomy 2 (1971): 147-60; 3 (1972): 11-26, 151-64 and 68-73; 5 (1974): 30-47. (21) Thom, Megalithic Lunar Observatories, p. la. (23) A. Thom, "A Megalithic Lunar Observatory in Islay," Journal of the History of Astronomy 5 (1974): 50-51. (24) R. J. C. Atkinson, Stonehenge (1956). C-14 dates in Antiquity 41 (1967): 63-64. (25) S. Piggott, "The Excavation at Cairnpapple Hill, West Lothian, 1947-8," Proc. Soc. Ant. Scot. 82 (1947-48): 68-123. (26) V. G. Childe, The Prehistory of Scotland (1935), pp. 116-17. (27) A. Thom, "The Metrology and Geometry of Cup-and-Ring Marks," Systematics 6 (1968): 173-89. (28) A. Burl, "Dating the British Stone Circles," American Scientist 61 (1973): 167-74. (29) S. Piggott, Neolithic Cultures of the British Isles (1954), pp. 18 ff. (30) I. F. Smith, "Windmill Hill and Its Implications," Palaeohistoria 12 (1966), pp. 469-8 1; G. J. Wainwright, "A Review of Henge Monuments in the Light of Recent Research," Proceedings of the Prehistory Society 35 (1968): 112-133. (31) H. Godwin "Radiocarbon Dates and British Archaeology," Philosophical Transactions of the Royal Society of London, sec. A, vol. 269 (1970): 57-76. (32) Notes 6 and 31. (33) G. J. Wainwright, Durrington Walls: Excavations 1966-68 (1971: Society of Antiquaries of London). (34) I am writing a book on this subject which, hopefully, will appear in 1975. It is fair to say that few British archaeologists would at the moment subscribe to the interpretations summarized here. (35) Thom, Megalithic Lunar Observatories. chaps. 5-7. (36) V. G. Childe, Skara Brae (1931). (37) Note 36 and S. Piggott, Neolithic Cultures, pp. 324 ff. (38) Royal Commission on the Ancient and Historical Monuments of Scotland, Orkney (1946). (39) A. Thom and A. S. Thom, "A Megalithic Lunar Observatory in Orkney'. 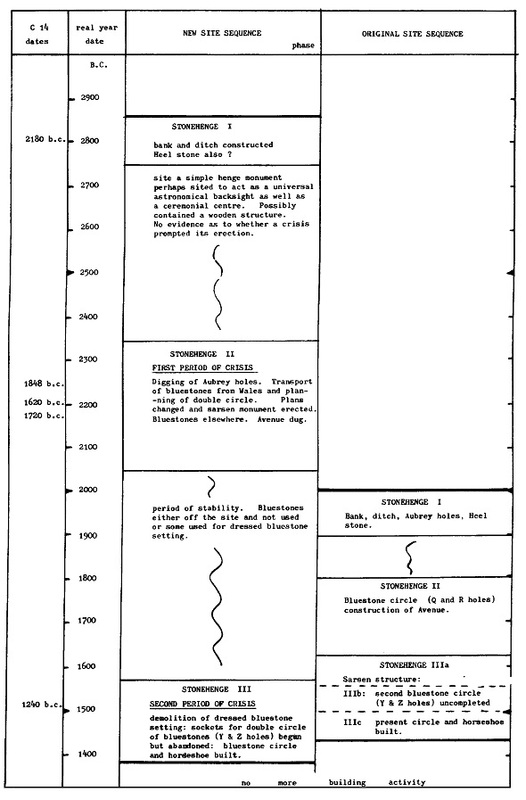 Journal of the History of Astronomy 4 (1973): 111-23. (40) Council for British Archaeology, Archaeological Site Index to Radiocarbon Dates for Great Britain and Ireland, ed. C. Lavell (1971 ff.). (41) Note 24; 1. F. Smith, Windmill Hill and Avebury (1965). (42) I. Velikovsky, Worlds in Collision (1950). (43) A. Thom, Megalithic Lunar Observatories, pp. 60-61.